As the number of functions and their usage grows, it is crucial to monitor and manage them effectively. 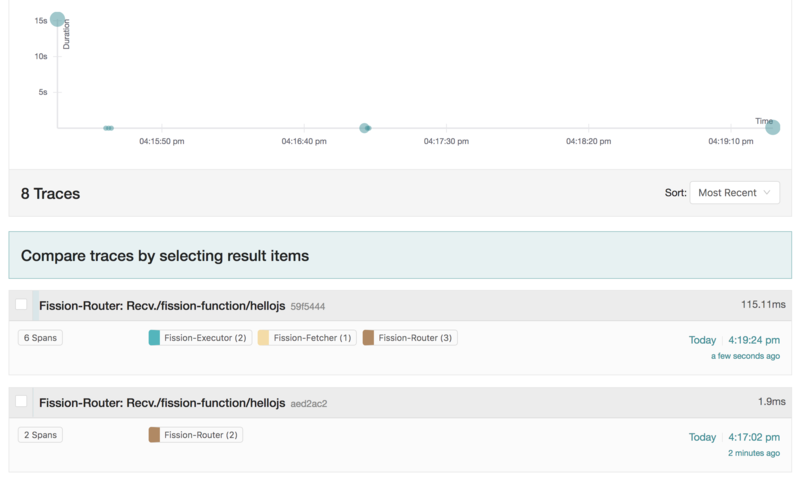 Fission already supports logs on CLI as well integration with external systems using Fluentd. Fission also has monitoring enabled using Prometheus and provides a great way to measure and track your functions automatically. Serverless functions can be part of a larger distributed system. For example, in the case of serverless applications that become more complex - spanning multiple functions, or in Microservices where functions are triggered between different services that talk to each other to process a single request or perform a business function. To ensure smooth operations of distributed systems you need to trace each request across multiple functions and invocations. This is critical so that you have a thorough understanding of the system’s behavior and can track performance across all its components. Recently, Fission added support for OpenTracing with release 1.0.0 and this makes monitoring and tracing functions at scale easy. 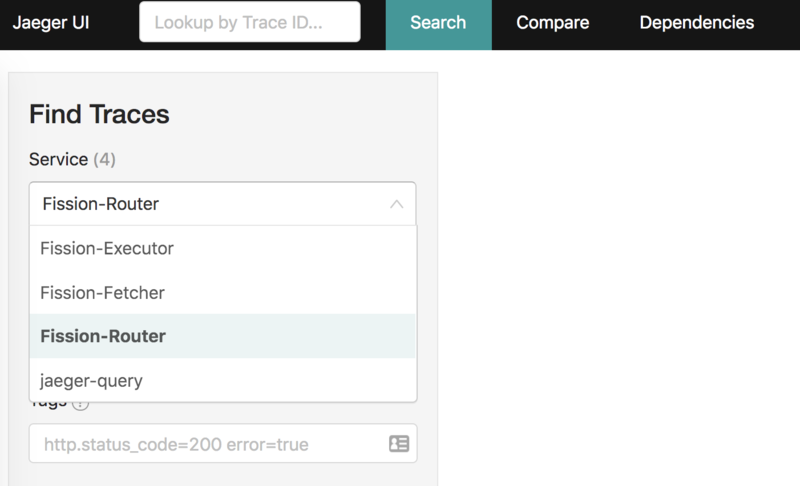 In this post, we will set up OpenTracing along with Fission and then test out a few simple functions to validate. SHOUTOUT: Thanks to one of our awesome contributors Adam Bouhenguel for incorporating the OpenTracing change in Fission! The rest of this post will walk through a step by step guide for setting up Jaeger as opentracing backend and Fission together. For the purpose of this tutorial, we will set up OpenTracing with the Jaeger backend - with a simple all in one topology. For your own production environments, you can either set up Jaeger with different configuration outlined in their setup guide or use a different backend supported by OpenCensus. After setting up an all in one Jaeger you will see one deployment and four services including one for Jaeger UI which has a LoadBalancer for accessing it outside of the cluster. You can also verify your set up by visiting the Jaeger UI at the public IP of the load balancer. If you are using plain YAMLs instead, then you will need to populate the value of argument –collectorEndpoint to all deployments and also populate the value of environment variable “TRACE_JAEGER_COLLECTOR_ENDPOINT” in all places it is used. If there are connection errors reaching the Jaeger collector endpoint then you will see warnings in the pods of the executor/router etc. If you don’t see any warnings then everything is working and we can continue. You will notice that the Fission services are now visible in Jaeger UI. Let’s choose the Fission router service and hellojs operation which corresponds to our recent invocation and search for traces. We can see the function’s recent invocations and the traces. Open tracing enables developers and operations teams to gather data about important performance and usability metrics of serverless applications. This becomes even more relevant for use cases with highly distributed functions and complex systems. Try out the OpenTracing in Fission and hit us up on Slack if you have any questions or queries.